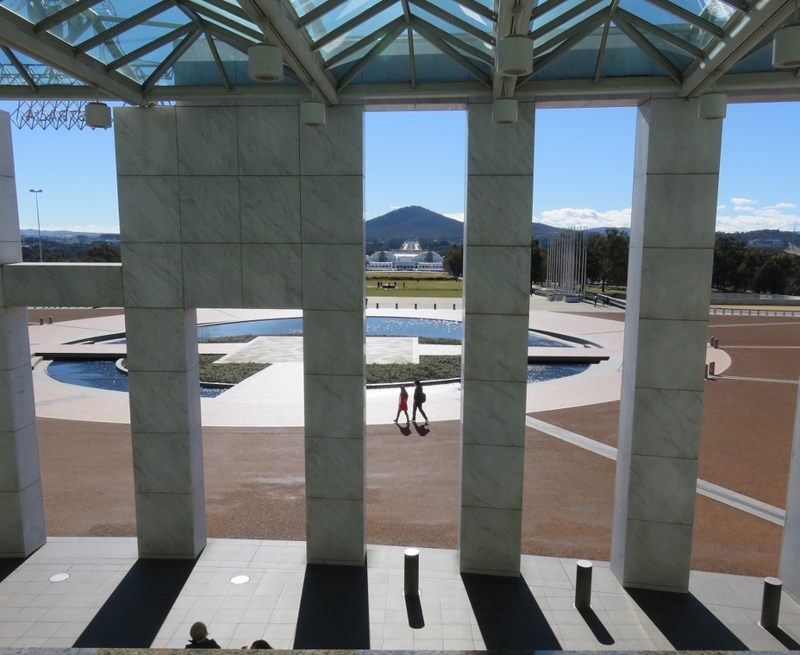 This is the entrance to Parliament House in Canberra, and it was designed by the New York based architectural company of Mitchell/Giurgola and Thorp. 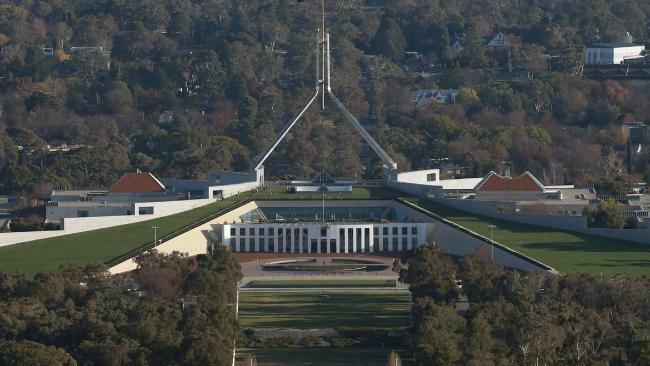 Parliament House should nest with the hill, symbolically rise out of the Australian landscape, as true democracy rises from the state of things. The building lies low in the landscape and is designed for the Australian climate, the landscape, and the beautiful clear quality of light. . 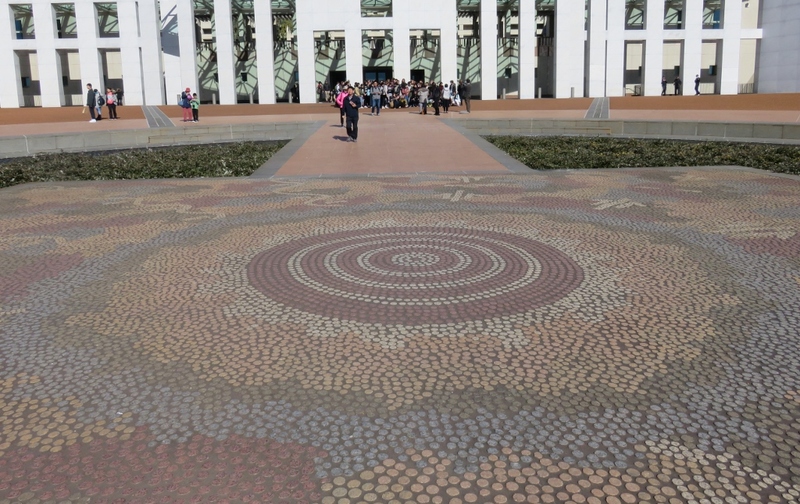 This 196 square metre mosaic in the front of the building has the inscription…. this place where we come and meet together…these drawings are part of the country we live in. Until recently it was the only Parliament in the world where you could walk over the Legislature. Many tourists, and local Canberrans will remember walking to the top of the grassy slopes, to view the city, to watch fireworks at New Year. 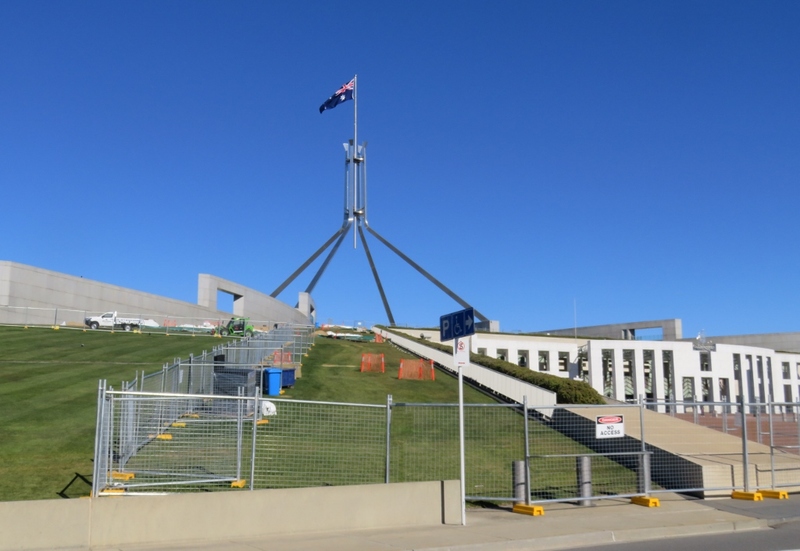 However, times are changing, and there is soon to be fencing around Parliament House for extra security measures. 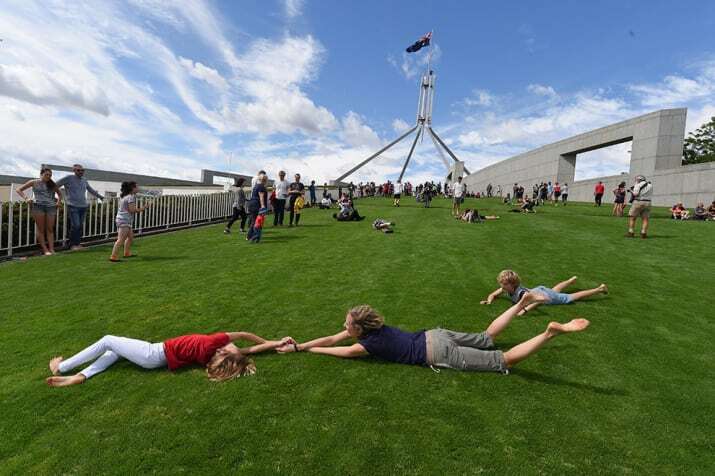 Recently, many people and their families met on the slopes of Parliament House to roll down the wonderfully grassy hills….in protest at the fences going up. The end of an era, and, sadly, I imagine our grandchildren will be amazed to hear that such a thing was ever allowed…a time of innocence. In late winter, when we arrived to take photos, the temporary fencing was being put in place. Meanwhile life inside the building continues as before. 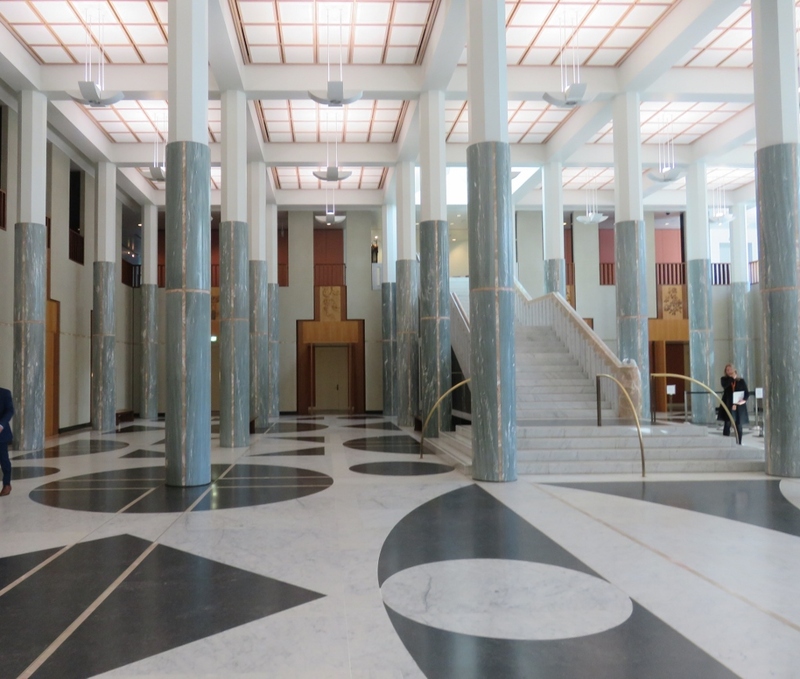 The entrance to Parliament House leads to the Marble Foyer. 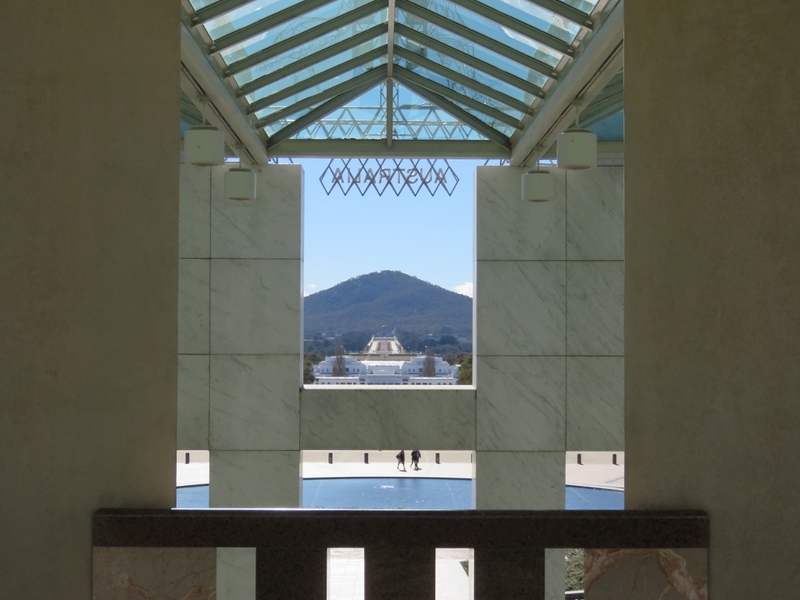 The 48 marble columns are in muted colours of pink and green….very much the colours of the Australian landscape. The stairs are clad in green Cipollino marble from Italy and salmon pink marble from Portugal. The walls feature twenty marquetry panels depicting Australian native flora. Paul and I had come to look at the copy of the Magna Carta, on the first floor, unfortunately it has been removed for restoration. ……never mind, the best view on this clear winter morning is from the Queen’s Terrace Café …. 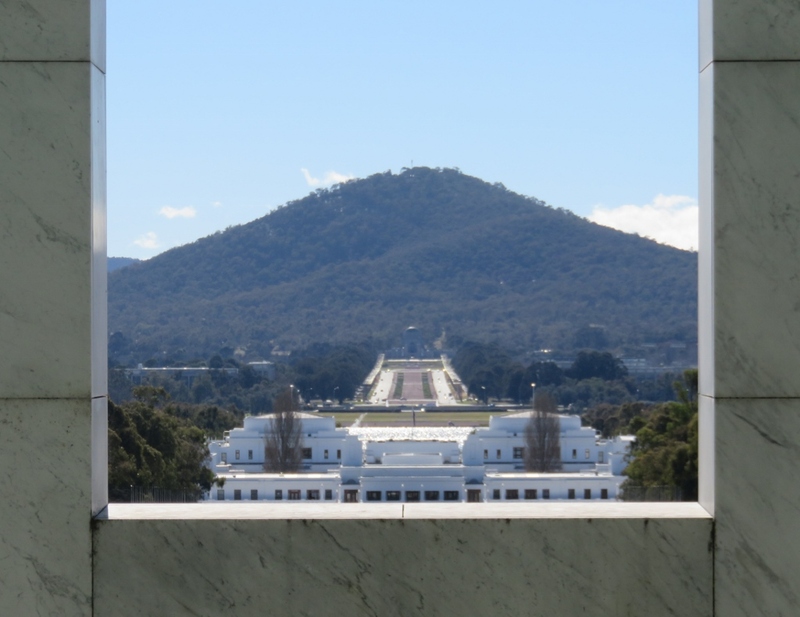 From here it is easy to see Walter Burley Griffin’s original design for Canberra. 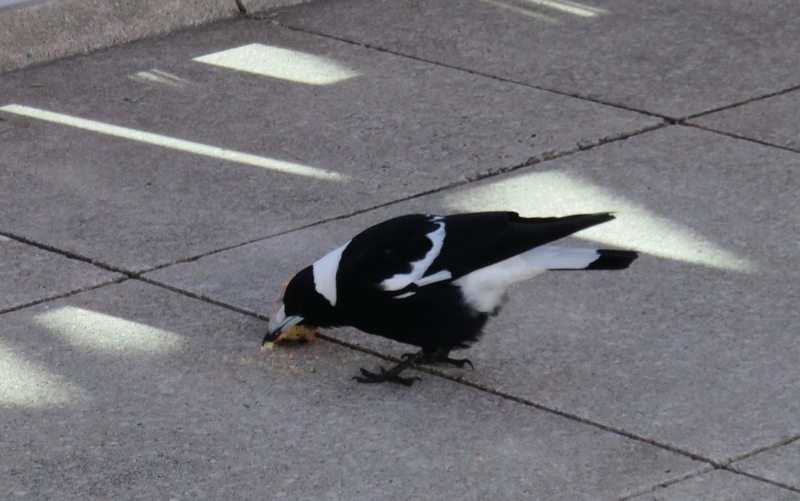 You are never far away from bird life in Canberra, and this opportunistic Magpie has taken the chance to take my Blueberry Muffin, while we take photos on the Terrace. 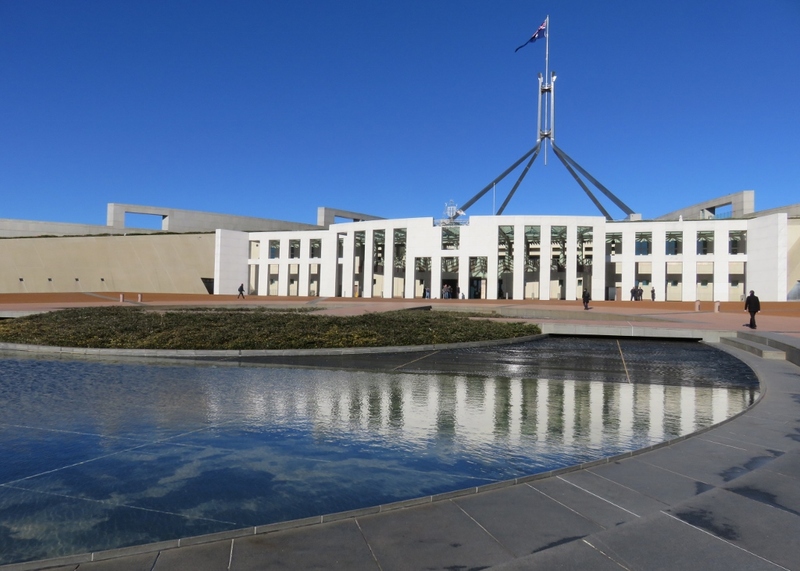 Paul and I have booked a tour with one of the gardeners of Parliament House, so I hope you can join me for future spring posts at Parliament House. 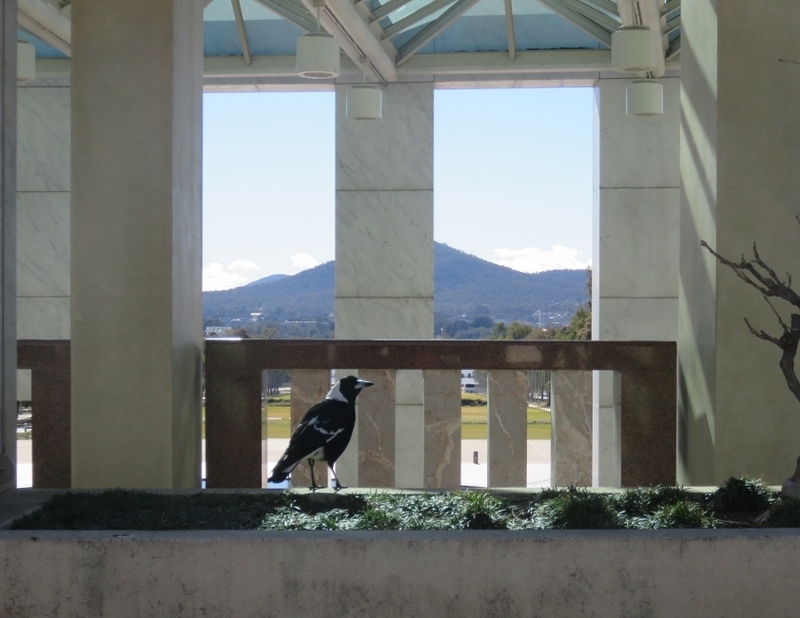 This entry was posted in Canberra's Public Gardens and tagged Australian Parliament House, Canberra, fences, Magpies, marble Foyer, Michael Nelson Jagamara, mosiac, Queen's Terrace Cafe, Romaldo Giurgola on October 2, 2017 by germac4. Most interesting, what a beautiful building with lovely views. Sorry about the fences going up though, what a shame. I agree it is a beautiful building, the architect would have been sad to see a fence around it..
Oh those nasty winds of change are just everywhere! The architects certainly got this grand building right. I was enthralled with Annabelle Crabb’s series, The House, on the inner and outer workings of the place. Who knew! Would love to be doing that tour with you. I agree, The House was a great series…..and yes, I’m hoping the courtyards look as nice as they did a few years ago. Sad development. I love visiting capitol buildings. This is a very fine one. Thanks Jason, it is a very interesting building and like a small city inside. Thanks Judy, yes, I somehow doubt fences will keep people safe, but the intention is there I guess. I think we’ve been lucky to live through such safe times, in recent history. Yes the fences sure are a sign of the times …. The whole place looks really different.. Glad you liked the rolling Aussies protesters! It is such a fabulous building, both inside and out. It is a shame about the fences. Our family have happy memories of visits, walking over the top of politicians and rolling down those grassy slopes. I wondered if our grandchildren will ever have that opportunity? Hope your family are doing well. Our grandson is now in a reasonable routine and the weeks are flying by. The fenced area looks terrible this week now that all the grassed area & the trees & hedges have been pulled out.. Dreadful! Glad your family could enjoy it the way it was.Our granddaughter is doing well too, she is nearly 6 weeks & everything is getting easier, routines & feeding etc. We go to see her as often as possible. Sad that situations like this are unavoidable now. The photo with the reflecting pond shows what a beautiful place it is. Yes! I agree these situations are unavoidable.. .. a sign of the times. Looking forward to the garden tour with you. Hopefully by then the planting will have settled in along the new fence. Yes the new planting might make a difference I think.I hope so it looks very messy at the moment.